A new Magic Band website announces a new Magic Band tour. The new site provides us with a suitably Magic web presence; my favourite bit being the archive of press reviews of many of the reunion shows. It’s a pleasing reminder that the reunion has been consistently booglarising us for over 10 years now, and the tone of the reviews is as equally thrilled and disbelieving in 2013 as it was in 2003. John French, Mark Boston and Denny Walley, along with their bandmates over the last decade, have achieved something truly remarkable. So get yourself out there if you can, witness an unforgettable show, revel in the affirmation, buy a t-shirt. 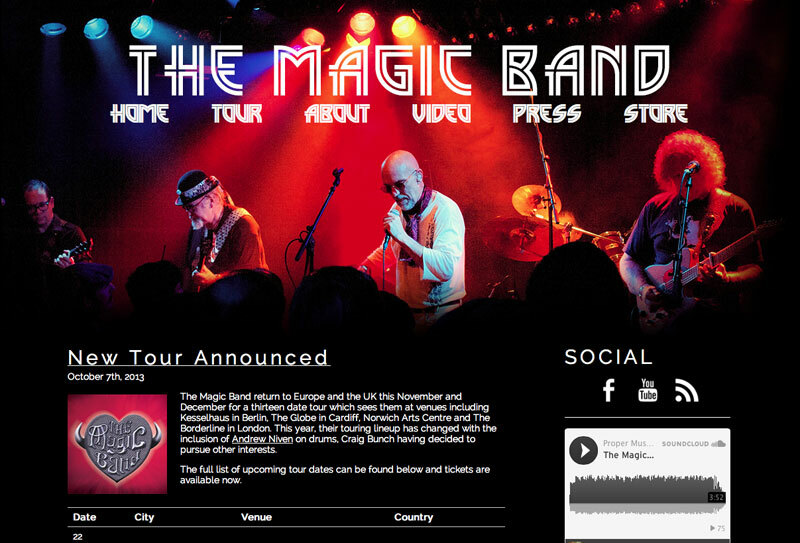 The Magic Band website has full tour details including show times, venue details and links to ticket outlets. I’ve just bought tickets for the Magic bands’ London show.I’m looking forward to it greatly. Keep up the “Great” work John. Look forward to hearing all about your tour,your old bass bud, Jerry. If I asked nicely would you sign some beefheart stuff for me. Would be happy to Frank! You’ll see I gave you a namecheck, here on facebook! Having seen Dweezil Zappa for the third time, recently, at the Warwick Arts Centre, I am now looking forward to seeing the Magic band at Leicester. OK I know Frank and Don only collaborated for a while, and fell out, but to me they embodied the same spirit in music. They explored. They invented. They shocked and surprised. They were courageous and entertaining, and they deplored the self-referential tedium that often passes for music. Sadly the Magic Band website has been hacked, it requests you to download ‘flash’ but it isn’t, it is a trojan containing a password stealer. Ha! Prophecy at work! You’re playing in April. Bought a ticket today. Thanks so much! The last show at London’s Borderline club was an exciting experience.The whole of the band were on top form, especially John French on vocals and mouth harp. I will need to go to another of their gigs. Here they go again in 2014! We will be touring our second home, the UK May 22, thru June 8. Still waiting for details. Manchester @ Band On the Wall May 29, and Garage / Islington on June 7th have announced, so tickets are on sale now! Go to our web site magicband.org or Ents24 you can find out more info as it comes in. Is that Mr. Ian ‘D’ submitting his comments? Thanks for spotting it Ian, should be a great night in Stockton. Tee shirts all round! If any of you havn’t bought your tickets yet get your fingers out before it’s too late. Does anyone know where comments on current shows etc can be found ? The old design of the radar station website made it easy to locate and scroll people’s comments each night of the Uk tour. But I cant seem to find that [or any other open forum) any more. Did you figure it out? I have the same problem and would like to get this resolved.